RBTH presents a selection of views and analysis from leading Russian media on polling in the Ukrainian parliamentary election, which took place on Sunday, Oct. 26. 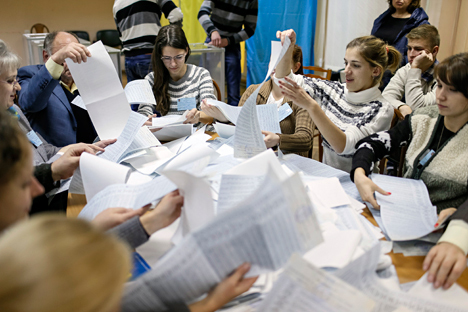 The Kommersant daily reminds its readers that some 4.6 million voters were unable to take part in the Ukrainian parliamentary election because not all districts in the Donetsk and Lugansk regions were able to organize voting. Experts polled by the paper predict that, with less representation of the southeast of the country, the new Ukrainian parliament will not be able to form a system of checks and balances. Kiev-based political analyst Mikhail Pogrebinsky told Kommersant that due to the ‘antiterrorist’ operation and the loss of Crimea, the Rada will get more right-wing radicals and Maidan representatives. The paper points out that sociologists’ forecasts of a low turnout proved to be true. Kiev-based pundit Dmitry Dzhangirov attributes this to people’s disappointment with the new authorities, which have proved unable to end the war in the Donbass region of eastern Ukraine. “People no longer believe that their votes can decide the country’s destiny,” he said. For his part, Ukrainian spin doctor Viktor Ukolov told Kommersant it is important that one-third of the new Rada will be made up of Maidan activists, battalion commanders and civil activists, who have no experience of working in government structures. Ukolov is convinced that this is a good thing, since the new MPs will force the authorities to listen to the people. However, it could result in a large number of conflicts between various forces inside the parliament. According to the Nezavisimaya Gazeta daily, over 100 instances of violations were recorded during the election. Most of them were related to candidates’ campaigning in single-seat districts as well as to attempts to ‘buy’ votes and ballot stuffing. The paper quotes Kiev-based experts as saying there are two key things that present a threat in terms of recognizing the election as legitimate and valid: discrepancies between the old law on elections and the current constitution and the fact that some members of the Central Electoral Commission have been in their posts for more than seven years. The paper recalls that Ukrainian President Petro Poroshenko promised, on the day following the voting, to submit to parliament a draft law canceling deputies’ parliamentary immunity. Nezavisimaya Gazeta adds that this idea has been promoted by public activists since former President Leonid Kuchma’s term in office, however, none of the people who have ruled Ukraine since have taken the risk of passing this law. An expert with the Institute of Euro-Atlantic Cooperation, Vladimir Gorbach, told Nezavisimaya Gazeta that the majority of the new Rada will be pro-Ukrainian and pro-European. At the same time, he said, the election of a new parliament will not mark a turning point in resolving the crisis in the east of the country, although it will strengthen the authorities’ clout inside the country. Expert magazine points out that the preliminary results of the election are very much in line with the forecasts made before polling day. There have, of course, been some surprises, with the main one being the results of the Self-Help party led by Lvov mayor Andriy Sadovyi, which came in third. The party, which has declared “Christian morality and common sense” as its ideology, has recently become very popular with the media, although it was still not listed among the favorites in this election. Although the final results of the election are yet to be announced, Expert’s writers believe that the new parliament will be skewed towards the patriotic and nationalist end of the spectrum, since it is this ideology that is currently being promoted, to this or that degree, by all the leading Ukrainian parties. According to the magazine, a parliament like this will find it difficult to take the flexible and difficult decisions now required to save the Ukrainian economy and strengthen security. Other problems that the new Ukrainian parliament is likely to face are fragmentation due to loyalties to different power groupings, and low representation, since large sections of the population were excluded from the election process.